“Musings” is a new section of Martin Elkort’s website. After Martin’s passing, I brought home boxes of journals and pages of writings and manuscripts. That he was a prolific writer is an understatement. As I sort through these papers, I will be posting these musings here, along with many of his photos with both his and my impressions, and hope you will enjoy them. His perspective is one of keen observation, the same observation that makes his photographs so poignant. His eye to the world never changed, only the mediums for the expression of what he saw. 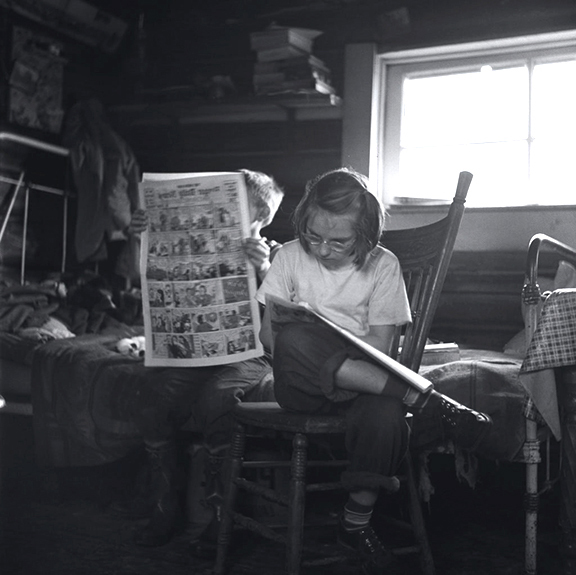 Sunday morning, the sharp light filtering through the windows, illuminating the scene as two kids are focused on the morning comics, or what they referred to as “the funnies,” with rapt attention. How many of us remember mornings spent this way? “I grew up in an intense street world in the Bronx. A working class immigrant Italian neighborhood. Your dad’s shots bring that whole experience back. He clearly knew and loved the streets. As do I looking at his photos and remembering them. Recently I’ve been having a lot of conversations with photographers about this very topic. How sometimes, the right photo can immediately tap into some primitive emotion of ours that brings up feelings of home and identification. Often from times when we were pre-verbal but we remember them because we felt safe and part of our community. That a photograph can be so evocative is truly the gift from the photographer to his audience. I was in New York City last week and made a special visit to see the sculpture “The Garment Worker” by Israeli sculptor Judith Weller that looms large on 7th Avenue. 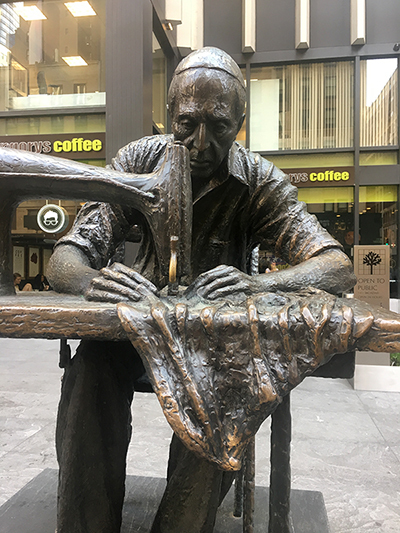 The statue is a testament to all the immigrant tailors who built the garment industry in the United States in the early part of the 20th Century. 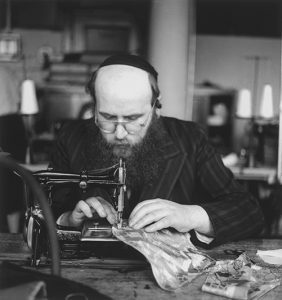 I was immediately struck by the similarity to a photo that Martin Elkort took in 1947 while photographing the ORT (Occupational and Rehabilitation Training) School that helped concentration camp survivors integrate into American culture by teaching them garment construction skills. 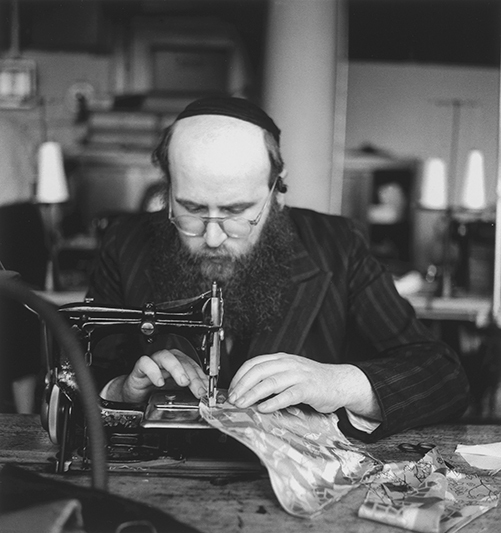 More of Martin Elkort’s ORT photographs can be seen on this website and the entire collection was donated to the United States Holocaust Memorial Museum in Washington, DC. This “musing” was written in one of Martin’s journals. His grandson Evan Twyford, read this piece at his funeral, because it so aptly captures how Martin constantly examined things, analyzed his surroundings and marveled at the wonder of how the world works. Our eyes are never shut, even when the lids are closed! Closing the eyes merely lowers the curtain on the continuous drama unfolding “before our eyes!” But backstage, the eye is still looking – until we fall asleep and abandon ourselves to the subconscious eye of our dreams. What, if anything, do our eyes see when the lids are closed? To find out, sit outside on a sunny day and let the sun shine directly on your “closed” eyelids. * What you are likely to “see” is a pink network of intersecting lines, dominated at the center by a large circular form. depending on how much sunshine is falling on your eyelids and how tightly your eyes are shut, the central form will seem greenish. These impressions are fleeting and ever-changing, like the images inside a kaleidoscope, but less precise and always in the red part of the spectrum. Now look closely and, if you are “sharp eyed” and objective, you may “see” small forms moving slowly through the network. These are red blood cells, making their way slowly through this tiny network of capillaries. *It requires a sort of Zen-like concentration until you get the hang of it. COPYRIGHT© 2018 MARTIN ELKORT, ALL RIGHTS RESERVED. ALL PHOTOGRAPHS AND WRITINGS ON THIS SITE ARE OWNED AND COPYRIGHTED BY MARTIN ELKORT AND MAY NOT BE USED WITHOUT THE EXPRESSED AND WRITTEN CONSENT OF MARTIN ELKORT. The cookie settings on this website are set to "allow cookies" to give you the best browsing experience possible. If you continue to use this website without changing your cookie settings or you click "Accept" below then you are consenting to this. You can read our Privacy Notification here.